Back Row (left): Asst. Coach Dave Berkemeier, Bat Boy Jared Bailey, Jackson Bailey, Cian Callahan, George Schmid, Jacob Crump, Mason Bowman, Coach Cliff Cash, Adam Cash, Brice McGee, Trey Workman, Asst. Coach Matt Bowman. 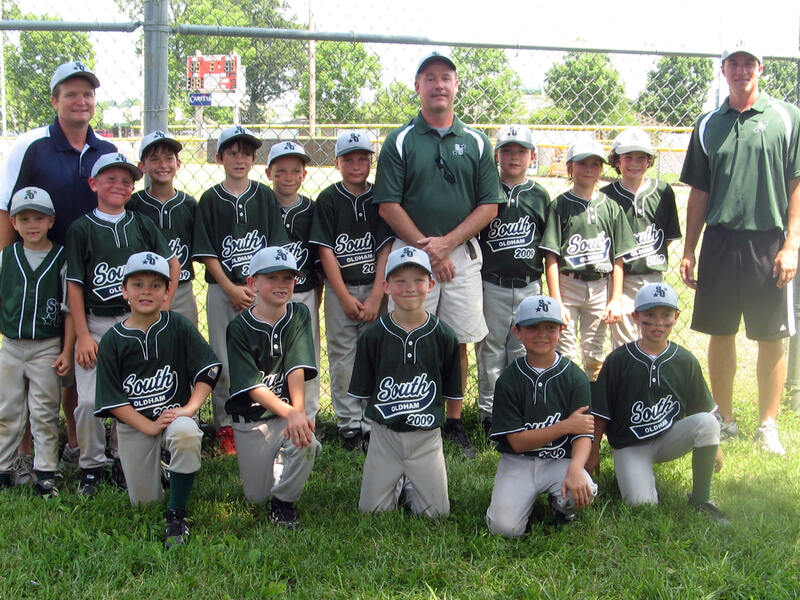 South Oldham beat the St. Matthews American team in a game dominated by defensive plays. Trey Workman had a double play at First Base to end the 2nd inning; George Schmid (pitcher) and Trey teamed up to get the final out of the 5th inning when they caught 2 opponents on 2nd base and tagged one out to stop a come back attempt by St. Matthews. Also contributing some great defensive plays were Jackson Bailey, Brendan McAfee, Brice McGee, Lincoln Price and Brock Brumfield. Going 2 for 2 at the plate were Brock Brumfield and Don Mitchell both with a double and a single and Cian Callahan with 2 singles. Mason Bowman also doubled. South Oldham hung on to win a very close game when Brendan McAfee bunted home the game winning run in the bottom of the 7th inning. South Oldham had strong defensive performances by Chase Berkemeier (2nd), Lincoln Price (OF), Trey Workman (1st), George Schmid (P), Jackson Bailey (3rd) and Brice McGee (SS). Brice was perfect at the plate going 3 for 3 with 2 singles and a triple. Jacob Crump had 2 key triples and went 2 for 3, Mason Bowman went 2 for 3 including a double, Lincoln Price went 2 for 3 including a double, George Schmid went 2 for 3 including a double, Jackson Bailey went 2 for 3 with a double and Don Mitchell went 2 for 3 with some aggressive base running. South Oldham had a total of 19 hits, 11 runs and 5 errors and is 2-0 in tournament play. The 8A all stars bats came alive in the first inning against the St. Matthews National team as they scored 5 runs. Jacob Crump had a 2 RBI double for the first two runs of the game. A few good hits by the St. Matthews Nationals and a few errors by the South Oldham team and we had a 5-4 ball game at the bottom of the first inning. After a scoreless 2nd inning for South Oldham, Brice McGee had 3 consecutive catches at short stop to retire the St. Matthews National team. The 3rd inning had the bats come alive again with doubles by Trey Workman, Brice McGee, Mason Bowman and Adam Cash and a triple by Jacob Crump that he scored on after a throwing error by 2B. St. Matthews answered back with 2 runs after a double play by Adam Cash who caught a fly ball in LF and threw to Trey Workman who made a great play at 1B to get the runner out. The 4th inning was all South Oldham with a rally of singles and a triple by Chase Berkemeier saw them score another 5 runs that went unanswered by St. Matthews National to end the game in 4 innings. Good defense tonight by Brice McGee at SS, Chase Berkemeier at 2B, Trey Workman at 1B, and Adam Cash in LF. Perfect at the plate tonight were Chase Berkemeier, Trey Workman, Jacob Crump, George Schmid and Mason Bowman. South Oldham is undefeated in tournament play and faces a tough Valley Sports team at 8 p.m. Tuesday, June 30 in St. Matthews. After 3 innings of play the score remained tied 1-1 in what was to be a game dominated by great defense. Jacob Crump (c) had an outstanding game as he threw out Valley Sports stealing 3B and caught a fly ball in the 2nd inning . The infield of Trey Workman (1B), Chase Berkemeier (2B), Jackson Bailey (3B), Brice McGee (SS) and George Schmid/Cian Callahan (P) along with Jacob accounted for all but one out in 6 innings of play. George Schmid and Jacob Crump were perfect at the plate both getting a single and a double. The South Oldham 8A all star team moves on to the semi-final round Thursday at 6 p.m. against Nelson County at St. Matthews.